Professionally written and researched family history. If you were to look on my own Family Tree, you would find my ancestor Mary Coleby. Mary was born in 1780. She was not baptised, but her birth was recorded at the Monthly Meeting of the Society of Friends (Quakers) of Tivetshall in Norfolk on 21st February 1780, the daughter of Caleb Coleby and his wife, Esther (nee Holmes). The Quakers were (and are) a Christian group who stress each member’s direct connection to God. Their meetings were generally held without the presence of any priest. Friends instead took part in silent contemplation or met to discuss issues within the community at the Monthly Meeting. For example, if a Friend intended to marry, elders of the community would be deputed to look into their character, noting sobriety and marital status before allowing the marriage to go ahead. Mary’s family were certainly not rich, but they were not the poorest either. Caleb’s profession is usually given as “shopkeeper” or “tanner”, but he came from a long-time farming family, inheriting land from his father, Caleb, in 1780 and his maternal uncle, John Burgess in 1799. When he died in 1831 aged 78, he described himself in his will as “farmer”. 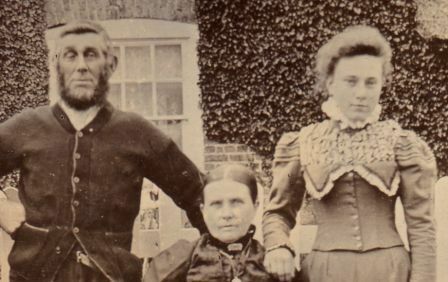 Similarly, Mary’s mother, Esther Holmes was from a farming family. Her brother, John Holmes, occupied Tivetshall Hall, next to Saint Margaret’s church in Tivetshall St Margaret. In his will of 1823, John describes himself as “gentleman”. If you study the Family Tree, you will see that the Coleby, Holmes and Burgess families had all been Quakers for several generations. Their names come up regularly in the Minutes of Tivetshall Monthly Meeting. As well as births, marriages and deaths, the Monthly Meeting records Members’ movements if they left the area and needed to attend a different Monthly Meeting and monies exacted from them in lieu of unpaid tithes (a tax to support the Church) to the Church of England, or "National Church" as the Friends called it. Records show goods, usually barley or oats, were taken from Caleb yearly between 1799 and 1812 averaging about £6 per annum in value. By comparison, in 1817 Mary’s wealthy cousin, John Holmes Jr, was forced to surrender goods valued at £151 and 4 shillings. Mary had two sisters, Esther and Sarah, and a brother, Caleb. Sarah (1782-1860) and Caleb (1788-1872) can be traced through the censuses. Esther’s birth is registered on 23rd September 1778. After that I can find no record of her and I suspect that she died in infancy, like so many children in those days. The Influenza which prevails so much in London has made its way into the country; but, it is hoped, a change to seasonable weather will put a stop to its progress, and restore the afflicted to perfect health. The Ague and intermitting fever has been more prevalent in Norfolk than hitherto known. The present influenza has extended itself to the brute creation, particularly horses, which have been afflicted with a cough, a wasting of flesh, and weakness. Bleeding and mercurial medicines have been applied with some success to those most useful animals. The present alarming influenza being now so universally afflictive, the following remedy has been given by an eminent physician with repeated success. Take a slice of bread, and toast it well on both sides till it is very brown, then spread on it some the best virgin honey, and take it night and morning regularly. This has been known to cure four or five in a family in three days. The Family Tree shows that the Quaker families of Norfolk were tightly woven, meeting regularly together and marrying within the community. For example: in 1798, Mary’s cousin, Benjamin Holmes, married Ann Coleby (another relative), whilst in 1801 Benjamin’s brother, William Holmes, married Sarah Coleby (a distant cousin)! 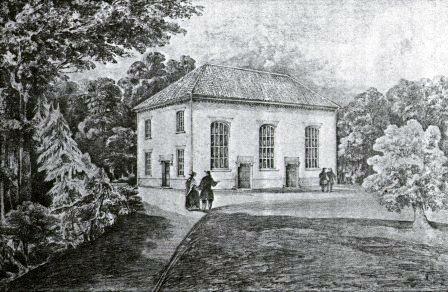 The Friends' Meeting House, Tivetshall. The next record I can find of Mary herself is in 1802 when she and her sister, Sarah, were witnesses to a marriage in St Margaret’s Parish Church in Tivetshall. Evidently the two young women felt able to take part in a ceremony of the "National Church". I have no way of knowing if they had their parents' approval. The following Minutes were received from the meeting of Women Friends and read in this meeting – Tivetshall Monthly Meeting of Women Friends held at Tasbro’ 14th of 6th month 1804. Mary Coleby, the daughter of Caleb Coleby having had for a considerable time an acquaintance with a young man not of our Society and Women Friends having visited her, but not having any expectation given them of the acquaintance being discontinued, we therefore refer it to Men Friends for their timely attention. Signed by order of the meeting by Sophia Holmes. The following friends were appointed to visit Mary Coleby thereon and report back to our next meeting, Thomas Broadbank, John Coleby, Thos Wagstaffe. One can easily imagine the uncomfortable meeting between Mary and the older women. It conjures that polite, but desperately uneasy discourse in the novels of Jane Austen; or, perhaps, the formidable ladies of “Cranford”. This Meeting being informed that Mary Coleby is married to one not in profession with us, by a Priest of the National Church, Thos Broadbank and T Wagstaffe are desired to visit her thereon and to report to our next Meeting. Mary had indeed married Samuel George, the 28 year old son of another local farmer, in St Margaret’s Church, Tivetshall, on 2nd November 1804. Despite the rift between Mary and her Quaker family, witnesses at the wedding included her cousin, John Holmes Jr, Mary Holmes, (probably John’s wife), and Mary’s sister, Sarah Coleby. Certainly, she had made her feelings plain and the consequence, as she well knew, would be “Denial”; a cutting off from her Quaker Community, family and friends. On 14th February 1805 the Minutes go on to record the Testimony of Denial… which said Friends are desired to hand to her. Mary and Sam went on to have five children: Elizabeth, a "honeymoon baby", born in 1805, William, born in 1808 who died aged just 6 months, another William in 1809, Robert, 1810, who also died young and lastly, in 1812, Samuel, my 3x great grandfather. Presumably, Mary was eventually reconciled with the Friends because all of the children’s births were recorded in the Monthly Meeting. The final reference to Mary Coleby in the Tivetshall Minutes is on 7th November 1813 when they recorded the burial of Mary, the wife of Samuel George, aged 32. The lady seated in this photograph is Mary's granddaughter, Mary George. With her are her husband, John Hotson, and her youngest daughter, Jessie Hotson. Jessie was my great grandmother.